We manufacture and supply an exclusive range of EDIBLE OIL PET Bottles which cater to varied applications of our valuable clients. 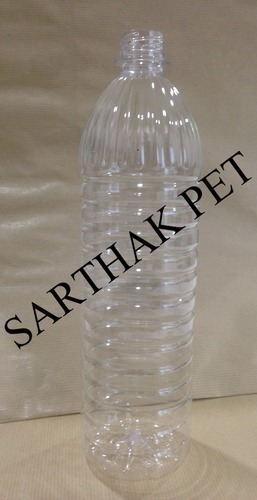 These Pet Plastic Bottle are sturdily constructed and offer trouble free performance. Our bottles are especially manufactured in accordance with the clients special requirements regarding design, material and size. We do not make compromise in terms of quality and so we procure raw material from the trusted vendors. Moreover, we offer our range of Pharmaceutical Bottles at affordable rates. Established in the year 2012, at Indore (Madhya Pradesh, India), we, “Sarthak PET Industries (India) Pvt. Ltd”, are one of the leading organizations, involved in manufacturing, exporting and supplying a wide and comprehensive range of Pharmaceutical Bottle, Water Preforms, etc. All our products are designed in compliance with international quality standards & norms, using high-grade raw material like plastic and other that are obtained from the reliable and certified vendors of the market. These products are widely acclaimed by the customers for their durability, reliability, leak-proof & unbreakable nature, lightweight and abrasion resistance. In addition to this, we provide all our products in various sizes, shapes, colors and designs at market leading prices to fulfill the demands and needs of customers. We also provide customization as per the specifications laid down by the clients.